Frog my favorite , when i use to work in Milano , i remember to travel in the summer to the pavese near by , the river , play bocce at the river and eat lot of Frittata with frog and of course the risotto ,, this my version ..
At slow fire, heat up pan with butter, and start to cook the onion .Add in sherry vinaigrette , some water , and cook for one hour until soft . The onion has to take the consistency of a cream. Adjust the seasoning and keep aside.Add water if u need make sure the taste is very gentle . Heat up a casserole , with extra virgin olive oil, add in the risotto, toast, add in white wine , let evaporate ;add in the stock little by little until cook or 18 minutes.Take out the risotto from the fire and add in butter and cheese. 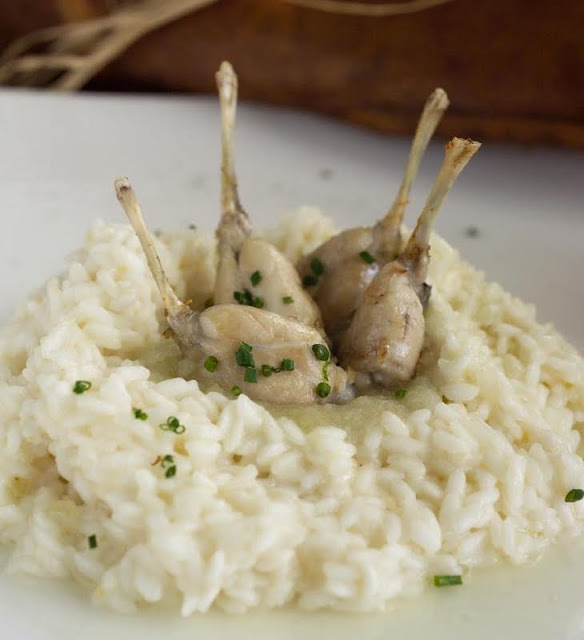 Place the risotto on a plate ,topped with the onion cream and frog legs. Serve with the chervil and white pepper. For the frog ; make sure u have the best legs , some like to add the meat inside , i like to enjoy separated . gelatin, what is it ?